iPage Black Friday Deals 2018 offers 75% OFF on regular hosting plan $7.99/month. You will get the same plan in $1.99/month during Black Friday and Cyber Monday Sale. This is the cheapest hosting plan in the entire web hosting industry. iPage offers huge discount for those who want to start their dream website with low budget. If you are budget-conscious and want to start a blog for small business and low traffic website, I must say you should start with iPage Web Hosting. How to Activate iPage Black Friday 2018 Deal? iPage was originally founded in 1998. They have over 1 million websites on their platform with two data centers. iPage is the cheapest web hosting company owned by the Endurance International Group. iPage is BlueHost’s sister company and one of the best web hosting providers for small business, low traffic, budget-conscious people. If you’re planning to host a heavy traffic website, then go with BlueHost Web Hosting they are also providing up to 70% OFF during Black Friday and Cyber Monday Sale. iPage Black Friday and Cyber Monday Web Hosting Sale will be LIVE from 23rd November (Black Friday) to 26th November (Cyber Monday). This is the time when you can grab the huge discount from iPage web hosting. If you have missed the iPage Black Friday Sale, no need to worry. You can still get their hosting package in just $1.99/month which is still lowest in web hosting industry. iPage is offering 75% huge discount on their shared hosting plan during Black Friday and Cyber Monday Sale. 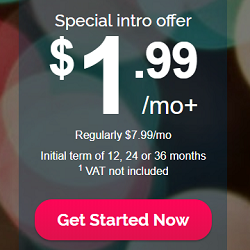 You can activate deal below to get your hosting plan at $1.99/month. iPage included everything you need to go online. Look at the features below to know more about what they offer. iPage offers one shared hosting plan that costs you $1.99/month during Black Friday and Cyber Monday Sale. To get the maximum discount, choose initial term of 12, 24 or 36 months. I always recommend everyone to buy iPage hosting for 36 months term because renewal cost is $7.99/month. You will get following features in just $1.99/month. Click here to activate the iPage Black Friday Sale discount. You will be redirected to their home page. STEP #1: Click on Get Started Now button and search for a domain name. This domain name will be free for 1 Year. STEP #2: Click on Next, choose my term. Select 3 years term to get the maximum discount. Now click on Next, customize my plan. STEP #3: Here by-default Domain Privacy, Website Security and Site backup & Restore features will be selected. If you don’t want to get them, just uncheck them and click on continue to payment. STEP #4: Now enter billing information carefully and click on Purchase Now to get the hosting account with iPage.